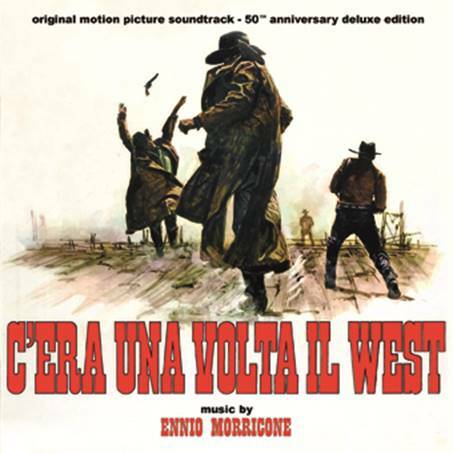 50 years ago, the fourth Western movie directed by Sergio Leone, C'ERA UNA VOLTA IL WEST, was screened for the first time, and in the plans of the director, should have closed the circle of his engagement with this cinematic genre. Compared to the Dollars Trilogy, the movie marks an important stylistic change; it's an epic full of allegories, with an immensely powerful script. Considered by many to be Ennio Morricone's masterpiece, it marks an evolution in his music, which often takes over for the images. Exceptional collaborators such as Edda Dell'Orso, Alessandro Alessandroni and Franco De Gemini are the main actors of this score, the director of which is the Maestro. It is to one of them, Franco De Gemini, whom Beat Records in collaboration with Universal Music Publishing wish to dedicate this 50th anniversary edition, in a guise you've never experienced before. An accurate remastering by Claudio Fuiano and Daniel Winkler corrected a few formal imprecisions of the wonderful previous editions as well as some minor stereophonic flaws, and now we can finally say we have an album that meets our expectations for such a milestone edition of this score. But the surprises don't stop there. Five years after the death of the popular Ferraran harmonica player, the entire recording sessions of the score were discovered, over three hours long, including studio chatter from which we extracted a small recording of Franco's voice while he is conducting sound tests to find the best sound for his harmonica in a particular scene. We present this gift to you at the end of the album as a memorial to this great harmonica artisan, a sonic cameo as a little witness to his industriousness. The CD comes in a jewel case with a richly-illustrated, 24-page booklet featuring liner notes by Daniele De Gemini. Limited to only 500 copies, it's a meeting with cinema and music history that can't be missed. So, I am expecting the PENULTIMATE Release of my ALL-TIME Favorite Score!! This is tremendous and serendipitous as last evening I was thinking "is there anything that needs to be accomplished" for the score to be the absolute BEST version to ever be released. JOY! All-Time Favorite film as well. A special limited edition of 51 copies, the CD comes in a wooden box with the artwork printed on the front and a rare archival picture of Franco De Gemini on the back. Each copy of this edition is laser-printed with a unique number ranging from 1968 to 2018, counting through the years since the movie's release. Also included is a richly-illustrated, 24-page booklet featuring liner notes by Daniele De Gemini and five small lobby cards in plasticized hard paper. I adore the film and score so please don't misunderstand when I say that I'm surprised that from three hours' worth of recordings there is only a single disc, there must have been an awful lot of "chatter" if we still wind up with the same 65 minutes. This feels a little more to be about repackaging than the Maestro's score in "milestone" presentation. Mr. Marshal...I am here tearing up...with water forming about to run like the Nile, down my cheeks!!! Unbelievable. At LAST. Hallelujah...Amen. All is now right within the universe. Have these people been taking lessons from the BBC? I'm finding it hard to see anything really new here. I will stand corrected no problem, but so far it just seems very little new... and I have the expanded edition of this lovely score thanks. Does it mean than we are finally getting STEREO versions of Once Upon A Time In the West and A Man With A Harmonica? Up until now these tracks have only been available in mono whereas the rest of the (original) album was stereo. It would be helpful if someone in the know could come here and explain just how they've improved this release. If they found the full sessions, why is this the same stuff as the last release??? Heh - I rarely impulse buy but this is just about my favourite score of all time and couldn’t resist. Will it fit on the shelf? Yep, unless it’s actual coffin size, which would be a bit of a surprise. They'll probably release the full sessions next year in a specially extended two disc version. I also pre-ordered one of the limited editions. With only 51 copies, this box edition could be sold out in a few hours. Thanks for your email, considering your question it’s true, this material lasts around 3 hours which shall be cut by all mistakes, tests and studio voices, so, it’s not three hours of music. Being told that the release of the total score is simply told impossible since it will need the approval of the Maestro who in the past allowed just the selection you already know. We all have to respect his will and things will not change, unless he will first change his mind. Of course a complete album would have been already released pretty before 50 years without the reason behind the whole story. This edition has been done not to miss this anniversary, it’s dedicated to the memory of my father who was one of the talking voices of this score, for my family this release is a kind of a thank you to a concept, a tribute to a legacy. The booklet is full if interesting insights and the audio is pretty better than ever but if you are interested in extra music only I think you’ll be disappointed by that. Hope I didn’t hurt your feelings anyway, say hello from Beat Records to FSM community! What's missing from the 65 minute program that's important? To my memory, the additional cues are pretty much repeats of material already covered in other tracks. So it is basically the same release as the last one with some improvements to the sound/stereo quality and there's no hope of the complete version ever seeing the light of day. That's sad, but I'm buying one anyway.